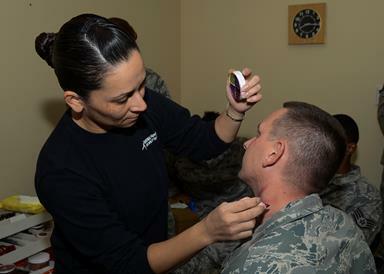 Oct. 24 was Domestic Violence Awareness Day, and the made-up bruises were part of an exercise, sponsored by Family Advocacy, to raise the level of awareness at Edwards AFB. Staff Sgt. Samón Carver, 412th Medical Group, NCOIC of Outpatient Records, was one of the volunteers that day. Only half of the people she encountered asked if she was okay. She observed that people seemed “uncomfortable” asking about the bruises on her face. Only those who knew her on a personal basis asked at all. Of those who did ask, some came across indiscreet, asking in public settings. “I think that I would be less likely to open up about what was going on in a room full of people with everyone staring at me. It was embarrassing and it made me think if the bruise wasn’t make-up and was real, I would have been emotional or would have made up a story,” said Carver. “Awareness cannot be expressed enough. I think that, as a society, we should be more responsive to others’ needs, to include when someone needs help. The whole ‘I don’t want to get involved’ idea should go away. Should we see someone with a black eye, busted lip or scrape on the face, ask if the person is okay. Ask if they have sought medical attention or spoken with someone. This society is [comfortable asking] about everything else but too scared to ask about each other’s wellbeing? That makes no sense to me,” said Carver. Cartwright added that people are often reluctant to get involved in another person’s life. In some cases, they may not have even noticed that something was wrong. She advised that if you see someone with a bruise, don’t make an assumption as to its origin, whether it’s domestic violence or not. If an injury is related to domestic violence the next step is to see if the alleged victim is thinking about reporting it. Much like sexual assault cases, Family Advocacy offers both restricted and unrestricted reporting options. While an unrestricted report is sometimes necessary, a restricted report can prove to be very beneficial to an alleged victim. A restricted report is about safety planning, emotional support and collecting resources. There is no medical attention or investigation at that point, but a report can be made unrestricted at any time. “I would love for more of the base to be aware of that because a lot of times a person who is in that cycle of violence may not be ready to leave just yet. They can feel a lot of judgment from people about that, but they might need time to plan things out. They may need to get birth certificates and cash and plan how to get out,” said Capt. Morgan Bergman, 412th MDG, Family Advocacy officer. According to Bergman, it takes the average domestic violence victim seven attempts to leave before they’re successful. When the alleged victim does finally leave, they are at their highest risk of fatality because the offender is most angry at that time. “While it’s not going to feel good to have someone come in my office, create a safety plan and go back into the home where the abuse is happening, it’s on their terms. They know their life and they know what’s safe and what’s not safe for them,” said Bergman. Cartwright noted that people who struggle with violence need safety plans too. Her goal is to help prevent domestic violence by creating a new skill set that offers an alternative action to violence. If you are suffering from domestic violence or maltreatment, call Family Advocacy at (661) 277-5292, or call the Department of Defense National Domestic Violence Hotline at (800) 799-SAFE. The Los Angeles County Domestic Violence Hotline is 800-978-3600. 9 comments for "Raising domestic violence awareness at Edwards AFB"
I hate seeing how common domestic violence is in the military. My sister has been involved in a physical domestic violence situation. It tore at our hearts every time we saw yet more black eyes, a broken nose and more. We begged here to leave him. We gave her all the resources we could muster. She had the love and support of her family and close friends. She never left him it has now been almost 20 years. He has managed to switch gears to phychological abuse now. This is an ongoing agony our family must quietly endure as she will fight US to defend him. Once my brother and I rescued a woman being severely beaten by a man. She stopped us from helping her and got in his truck to be driven away for more….He was her “boyfriend”. So I’m not insensitive but I wouldn’t want to get involved either at this point. Sorry. 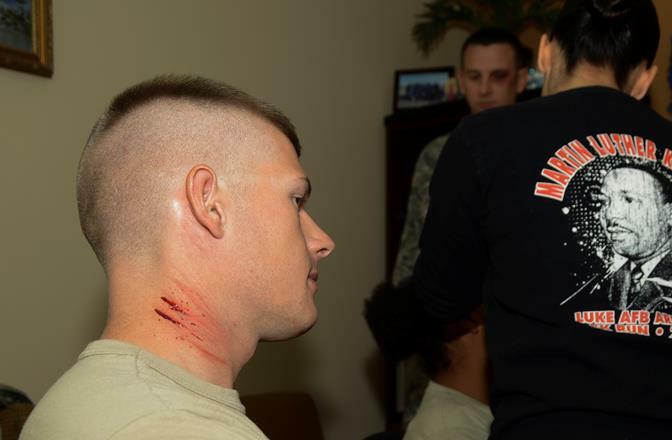 The military takes domestic violence seriously, even 10 years ago. Nice try to make the military look bad. I don’t understand why this site posts comments from trolls. Dude, I’m a retired Navy Chief Petty Officer and former employee of Edwards AFB, so I can tell you with 100% certainty that I don’t try to make the military look bad… they do a great job of doing that by themselves! While I get the concept….I see this as very insensitive to women and men who have had to go through it. For those that have PTSD due to DV it could be a trigger. I would have walked off the job. Oh quit being so damn sensitive. It’s about awareness. At the expense of victims. But screw those who have gone through it before…right? Spoken like a chauvinist….congrats.